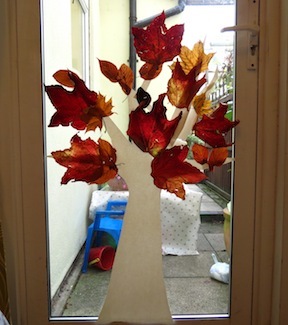 Make Your Own Autumn Tree! 1. 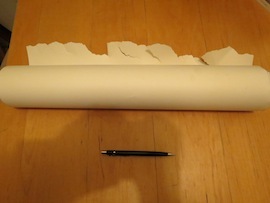 Lay your roll of paper out on a table and roll it out to about 1 metre high. If you have small children this is a good size. If you have taller kids, roll it out to, say, 2 metres! 2. Draw the outline of a large tree trunk and branches on to the paper using up as much of the paper as possible. 3. Cut out your tree and stick it to a wall or door. We stuck it to the glass door that leads to our back yard using sticky tape, but you could use blu-tak. 4. Using the scraps of paper that are left from cutting out, make some longer branches and add them to the tree. In the pictures you can see our first tree on the left and once we had stuck longer branches onto it. Option: You could get your kids to paint or colour the tree trunk in brown. We did not do this. 5. 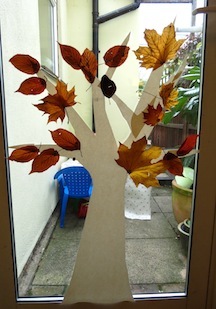 Get your autumn leaves together in a big pile and place bits of blu-tak onto the backs of them. Stick them to the tree! TIP: You can leave this tree up for days or weeks and keep adding to it.....we found these beautiful red ivy leaves after we started our tree so we added them too! Looking for more kids fall craft ideas? 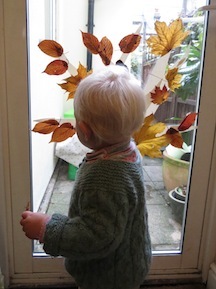 Try our pattern and instructions for decorating a robin red-breast with autumn leaves.